Islam is a way of life, the religion for this world and the other. The meaning of Islam is submitting to the Will of Allah (Arabic word for God). The foundations of Islam are established in the Qur'an and hence are non-negotiable. They can be summarized as the Five Pillars and the Seven Articles of Faith. 1. The Declaration of Faith (al-shahada): "There is no god but Allah and Muhammad is the messenger of Allah". The first half of this declaration affirms Islam's absolute monotheism, an unshakable and uncompromising faith in the oneness or unity (tawhid) of God and His absolute transcendence. The second half declares how His message was transmitted to humanity through His prophet Muhammad. This acknowledgement of, and commitment to, Allah and His Prophet is simply the means by which a person professes his/her faith and becomes a Muslim. 2. Prayer (salat): Five times each day - predawn (fajr), noon (zuhr), afternoon (asr), Maghrib (sunset) and 'Isha (late evening), individually or in a group. They can offer their prayers wherever they may be - in a mosque, at home, at work, or on the road. On Friday, the noon prayer is congregational prayer, recommended to all adults. (Q, lxii, verses 9-10). The person leading the prayer (Imam) delivers a sermon (khutbah) on social, religious or political issues of the day important for the congregation. It is customary in majority of Muslim countries that men pray in congregation and for women it varies from region to region. In Islam, prayer has a wider significance, in the sense that it is meant to help the individual develop consciousness of the Creator, Allah, and to have communion with Him for a short time, five times a day in the midst of other daily mundane activities. For details of the ritual of praying , please see the section below, "Rituals, Practices and Festivals." 3. Fasting (sawm) during month of Ramadan, the ninth month of Islamic calendar. From dawn to sunset, all adult Muslims whose health permits are to abstain completely from food, drink, and sexual activity. Ramadan is a time for reflection and spiritual discipline, for expressing gratitude for God's guidance, and atoning for past sins, for awareness of human frailty and dependence on God, as well as for remembering and responding to the needs of the poor and hungry. During this month, Muslims perform additional devotional prayers (salat al- tarawih), combined with the late evening prayer. As the end of Ramadan nears (on the 27th night in particular), Muslims commemorate the "Night of Power" (lailatul qadr), when the Prophet Muhammad (peace be upon Him) first received God's revelation. (For details, see Q. 97: 1-5, 1765.) The month of Ramadan comes to an end with a great celebration, the feast of the breaking of the Fast, Eidul - Fitr. 4. Almsgiving (zakat) is both an individual and a communal obligation, so payment of zakat instills a sense of communal identity and responsibility. This promotes social welfare of the community by redressing economic inequalities through payment of an alms tax. It is an act both of worship or thanksgiving to God and of service to the community. It is levied at the rate of two and a half percent on accumulated wealth and assets after normal expenses each year. The Qur'an and Islamic law stipulate that alms (zakat) are to be used to support the poor, orphans and widows. 5. Pilgrimage (Hajj) is asked for every adult Muslim who is physically and financially able to perform it once in his/her lifetime. The focus of the pilgrimage is the Ka'bah, (sacred cubic-shaped structure called by the Muslims, the House of God in which the sacred black stone is embedded, situated in Mecca, Saudi Arabia). The pilgrimage takes place once a year in the twelfth month, Dhul-Hijja, of the Muslim lunar calendar. It is a pilgrimage, not only to Mecca, but also towards God, the Creator, and a time to reflect the attributes of God, the attributes of mercy, compassion, love, and concern for others, of repentance and forgiveness. It is a unique experience individually as well as collectively. Muslims of all races and tongues from around the globe congregate in millions in the sacred places of Mecca and Medina in Saudi Arabia. The pilgrimage ends with the Feast of Sacrifice (Eidul - Adha). It commemorates God's command to Prophet Abraham to sacrifice his son Isma'il. When he was all set to do so, God switched a ram to be sacrificed in place of Isma'il. The pilgrims sacrifice animals (sheep, goat, cattle or a camel). It should be noted here that all Islamic festivals, celebrations etc. are based on the Islamic calendar, which is lunar. The lunar calendar is 10-11 days shorter than Gregorian calendar and hence it repeats every 36 years. Consequently, all celebration days vary from year to year. First a few words about the formal place of congregational prayers: Mosque (masjid) is considered the nerve center of Muslims as a group wherever they may be. In the history of Islam as a religion and as civilization, from the lifetime of the Prophet (peace be upon him), the mosque has been the forum to pray together, to learn together, to discuss political and social issues relevant to the community living in the area, and to unite the community. It served as an inn for the travelers, to feed the hungry, to provide refuge to individuals in distress. When you enter a mosque, removal of your shoes is mandatory for Muslims and non-Muslims. There is no formal dress code; simple and modest clothing should cover all parts of body (shorts and bikinis not permitted) and women are encouraged to cover their head with a scarf. 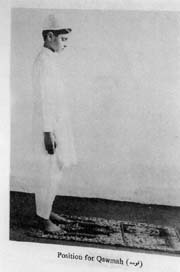 In all properly built mosques, usually there is a niche in the prayer hall (mihrab) indicating the direction of prayer toward Mecca. It also determines the direction of the rows. It is also the spot where Imam (religious person who leads the prayers) stands when addressing the congregation. The floor of the prayer hall is carpeted with the markings for the rows. There are no pews or allotted seats; people sit or stand in the rows as they come. All human beings are equal, irrespective of their race, colour, and socio-economic status. Generally, for women and girls, there is a separate hall, a mezzanine floor with a view of the Imam or an area at the rear of the main prayer hall. In the prayer hall or any other part of mosque, no photos, pictures or statues are displayed. The only decorations are verses from the Qur'an inscribed in beautiful calligraphy. Before joining a congregational for prayer or praying individually, a Muslim must have either a bath or perform ritual ablution (wudu). 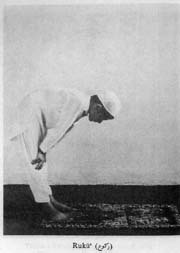 It comprises of washing your hands, rinsing your mouth, cleaning your nose, washing face and forearms up to elbows, wiping head, and neck, cleaning ears with wet hands, and finally washing feet up to ankles That completes the ablution and worshipper is set for offering prayer to Allah. While facing in the direction of Ka'bah, the worshipper silently declares the intention to pray. 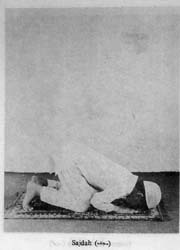 "Prayer is better than sleep"
Performance of prayer has several postures and for each posture the Arabic terms are given in parentheses: Intention to pray is followed by (Takbir-i-Tehrima), standing (qiyam), bowing (raku'), standing momentarily (qawmah), prostrating oneself with forehead and nose touching the ground (sijdah), followed by sitting position (jalsa). 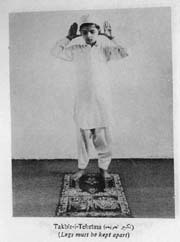 One unit of these postures is named in Arabic, rak'ah. The last two photos are from (jalsa) position in the last rak'ah, (salam) to the right and (salam) to the left and concludes each prayer. 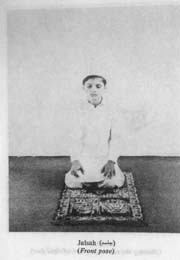 Each obligatory (fard) prayer consists of two, three or four rakahs, depending on whether it is predawn, noon, afternoon, sunset, or evening prayer, and it is offered in a specific format as described below. 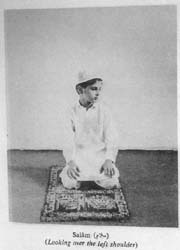 Obligatory prayer means that it is an individual's duty toward the Creator, Allah. In each rakah, the opening verse of the Quran, (al-Fatihah) is repeated. You do we worship, and your help do we seek. It is recommended to adults to offer the Friday prayer in congregation (noon prayer) in a mosque where the resident Imam (or occasionally a guest scholar) delivers sermon (khutbah) before the prayer (a distinctive feature of this prayer). People start arriving before the prayer time and sit down in rows. In progressive mosques, khutbah is delivered in Arabic and English/French, switching from one language to other. In traditional mosques, the main khutbah is delivered in Arabic and paraphrased in English or French, depending on the demographics of the congregation. In general, the khutbah should relate to the current events, in the city, country or the world, with references to relevant Quranic verses and the sunnah (tradition of the Prophet). Please note that the timing of the steps may vary during the daylight saving and standard time (Summer or Winter). Most of the mosques in Montreal do not change their times to avoid confusion. However, some mosques advance the times by 30 minutes in the Fall and Winter (Standard Time). 2. 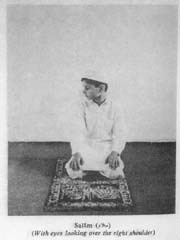 The second adhan at 1.20 p.m., followed by the khutabah (duration fifteen to twenty minutes). 3. Friday prayer (salat al-Jum'ah), comprised of two rakahs, is performed behind the Imam and is led by him. Therefore, the worshippers follow the Imam. Parts of prayer where Imam is silent, the worshipers recite the required portions of the prayer silently. These two prayers are offered in congregation and provide opportunity for the social interaction of the community. It is comprised of two wajib (binding) rakahs, with additional takbirat (pronouncement of 'Allah is the Greatest'). The prayer is led by the Imam, and is followed by a short sermon. After the prayer, people hug each other (friends, acquaintances and other worshipers) while wishing them Happy Eid (Eid Mubarak). The Prophet's birthday is commemorated each year by holding functions at many mosques and inviting guest speakers, who reflect on his life, and his numerous attributes (aswatul hasana). It falls on the 12th day of the 3rd month (Rabi-ul-Auwal) of the Islamic calendar. Refreshments are served at the end of the meeting. The largest group of Muslims is the Sunnis. They consider themselves the followers of the sunna (tradition) of the Prophet, restrict the religious authority to the Qur'an and the Prophet and their interpretation through consensus of the community (ijma'). The full name of the Sunnis is ahl al-sunnah wa al-ijma' (the People of the traditions of the Prophet and the Consensus). They recognize the first four successors (khalifas, caliphs) of the Prophet in political leadership and not in prophet-hood, attribute no special religious or political function to the descendants of the Prophet's son-in-law 'Ali', and adhere to one of the four Sunni Schools of Law (Hanafi, Shafi'i, Malaki and Humbali). They constitute 85% of the total Muslims in the world. The name shi'ah comes from shi'at 'Ali' (party of 'Ali). Ali ibn Abi Talib (d. 661) was a cousin of the prophet and his son-in-law, married to his daughter Fatimah, and was one of the first converts to Islam. Historically, the roots of Shi'ism go back to the time immediately following the Prophet's death in 632, when Abu Bakr (d. 634) was elected as Caliph, (successor to the Prophet) at the popular assembly (saqifah) in Medina. 'Ali was not present there, since he had stayed at the Prophet's deathbed. A small group of people wanted him to succeed the Prophet. 'Ali had to wait Umar (the second Caliph, d. 644) and Uthman (the third Caliph, d. 656) before being elected the fourth Caliph. In the mean time, Mu'awiyah, a relative of Uthman, had become governor of Syria, and opposed 'Ali, which led to a long and inconclusive Battle of Siffin in 657 AD (36 al-Hijra), and to the secession of the Kharjites (separatists) from Ali's army. In 661 AD, Ali was assassinated by the Kharjites. His elder son, Hasan (d.670 AD) was elected Caliph in Medina, but because of the threat of attack from Mu'awiyah, he ceded the Caliphate to him. After the death of Hasan, his younger brother, Husayn, the only other son of Ali and Fatimah, succeeded him and revolted against Mu'awiyah's impious son Yazid (d. 685), was defeated by Yazid's army and was martyred in Karbela in 680 AD along with many of his family members. (For the tragedy of Karbala, see Muharram in the site, "Shiane Haidery Islamic Association Inc."). The fate of 'Ali and his sons is regarded a great tragedy in Islam, both by Shi'is and Sunnis. The Sunnis hold 'Ali in a high place as he is a great champion of Islam in its early fight to survive and the venerable fourth Caliph, one of the Khulafa'ar-rashidun (the rightly guided Caliphs). The Shi'ites, however hold Ali in a special high place in a spiritual function, along side the Prophet and as his designated successor, Imam. 2. Fivers (five Imam Shi'ites), also called Zaydis. 3. 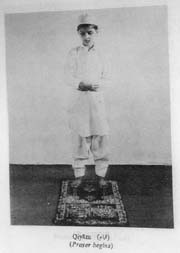 Seveners (seven Imam Shi'ites) are the Ismailis (followers of Agha Khan). For details, See 'Jamat Khana and Ismaili Centre'. The Ahmadiyya Muslim Community was founded by Mirza Ghulam Ahmad of Qadian, India in 1889. He declared that he was the Promised Messiah and al-Imam al-Mahdi. He claimed that Ahmadiyya is not a new religion. It represents the essence of Islam in all its purity, as enunciated by the Prophet Muhammad (PBUH). See 'La Communaute musulmane ahmadiyya du Quebec'. 1 The author (Mumtazul Haque Rehman) is grateful to Dr. Alvi for involving him in this important project. He greatly appreciates her guidance and support right from the inception of this project. 2 M. A. Sherif, Searching for solace: A Biography of Abdullah Yusuf Ali, Interpreter of the Qur'an (Kuala Lumpur: Islamic Book Trust, 1994), 128. This section is in progress. More references will be added and will be thematically Organized later on.